More senior business leaders are recognizing the value of their core data assets. Enterprise data applications are now driving a broad cross-section of business technology investment and associated high-profile digital transformation projects. According to the latest worldwide market study by 451 Research, enterprise IT leaders are embracing a new model of off-premises, service-oriented IT solutions and will be harnessing data in new ways to differentiate themselves in 2018. 451 Research finds that an IT organization's ability to exploit digital transformation is uneven, with over 60 percent of organizations having no formal transformation strategy in place and many admitting they face challenges in achieving optimal business-IT alignment. Sixty percent of those organization surveyed say they will run the majority of their IT outside the confines of enterprise data centers by the end of 2019, primarily utilizing off-premises service provider environments such as public cloud infrastructure and associated software-as-a-service (SaaS) offerings. Accordingly, the largest spending increase in 2018 is for IT delivered as-a-service, at the expense of the traditional on-premises model. 451 Research finds information security is also high on the CIO and CTO strategic agenda, with 16 percent of organizations saying that area of IT investment is getting the largest budget increase. According to the 451 Research assessment, some cloud providers are emerging as strategic technology suppliers; 35 percent of organizations say Microsoft will be their most strategic partner by the end of 2019, compared to 33 percent today, while 17 percent say AWS will hold that position two years from now compared to 7 percent today. The survey also highlights a revolution in how organizations will harness data to differentiate themselves and create new commercial value. 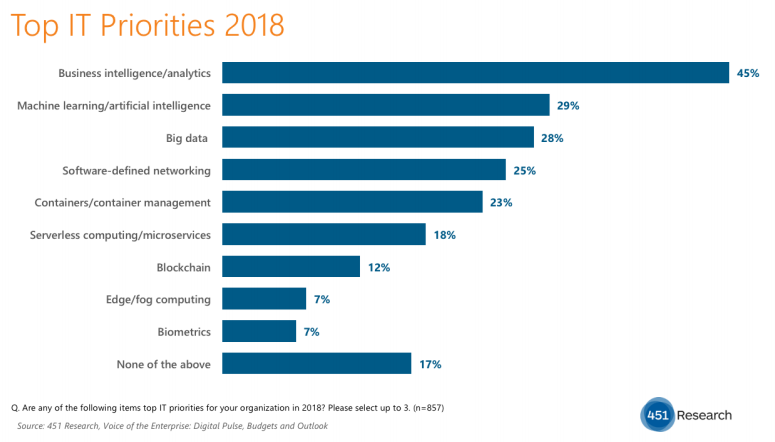 The top three IT initiatives for 2018 were all data-centric -- 45 percent of respondents pointed to business intelligence, 29 percent mentioned machine learning (ML) or artificial intelligence (AI), while 28 percent said big data analytics. The growth opportunity around data is clear with almost 30 percent of enterprise organizations saying ML and AI is a top priority in 2018, while just 12 percent of respondents use these solutions today. 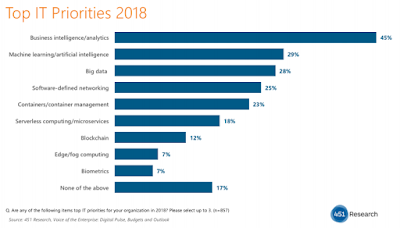 Meanwhile, usage of much-hyped technologies such as blockchain remains very low, but more organizations will begin to move from proof-of-concept pilots to actual deployment over the next year, with 12 percent of survey respondents citing blockchain as a top IT priority for 2018. “The survey suggests that many -- but certainly not all -- organizations are finally reaching the point where they can focus on endeavors that help differentiate the business, instead of merely keeping the lights on. In 2018, we expect to see much of this effort focused around a new set of approaches to data optimization and analysis,” said Melanie Posey, vice president at 451 Research.